Recently, we had the opportunity to read a very cute children’s book titled "Running with Chester" by Thomas Anthony Golaszewski. 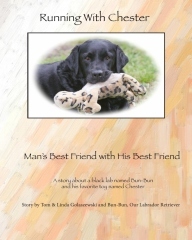 Geared towards children ages 2-10, "Running with Chester" is about the Golaszewski's Black Labrador Retriever named Bun-Bun and follows him through his daily adventures with his favorite toy, Chester! Filled with cute photos of the adorable Bun-Bun, you'll learn of the fun that Bun-Bun he has throughout his day including, meeting a gopher tortoise, chasing squirrels and playing with Chester. Children will love "Running with Chester," as they will learn about caring for a Labrador Retriever. Watch as Bun-Bun goes on a trip to the veterinarian, gets brushed, feed and goes on his daily walks. A great read for all young children. Photos are adorable, story is sure to keep your younger children's attention, while teaching them the responsibilities of dog ownership. A definite recommended read from All About Labradors and wonderful job done by the Golaszewski's! Disclosure: I would like to thank Thomas Golaszewski for the opportunity to review "Running with Chester." The opinions within this post are of my own and I was not influenced in any way. I was not compensated in any manner, other than the opportunity to review "Running with Chester." My reviews may not always positive, but they are my personal and honest opinions. Please conduct your own research before purchasing products. For more information about All About Labradors please read our Disclaimer and Disclosure Policies.